Nelson was convicted of the August 1987 slaying of James Howard. Howard reportedly approached Nelson in Houston and took him to his townhouse for sexual purposes. Once inside the townhouse, Nelson hit Howard with a metal bar and stabbed him repeatedly with a kitchen knife. Nelson was sentenced to death in Harris County in August 1988. AUSTIN — Texas prison officials have recovered another cell phone charger and SIM card in the cell of a death row inmate, the latest in a series of similar discoveries. 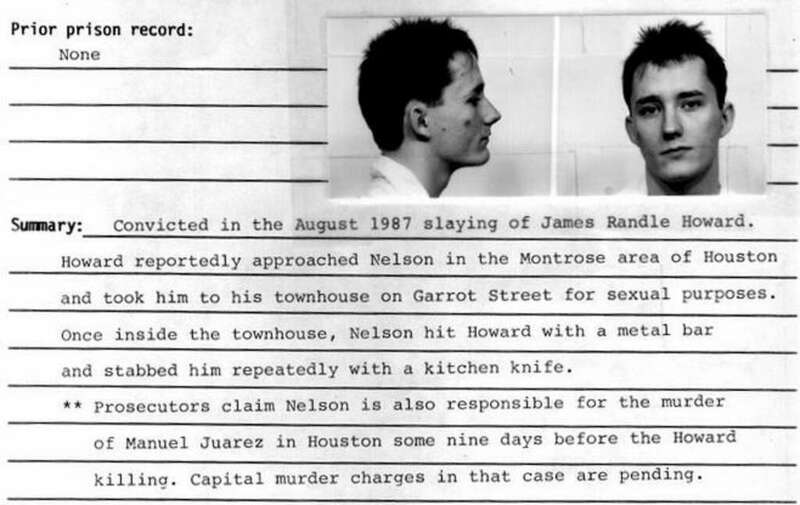 Michelle Lyons, spokeswoman for the Texas Department of Criminal Justice in Huntsville, said the contraband was found Thursday in the cell of Marlin Enos Nelson, who is facing execution for the August 1987 slaying of James Randle Howard in the Montrose area of Houston, the Austin American-Statesman reported Thursday in its online edition. Investigators said searchers had seized a smuggled cell phone from Nelson's cell on Oct. 24. Prison investigators have recovered five smuggled cell phones or components on death row, supposedly the most secure part of the prison system, since a statewide lockdown ended on Nov. 12. During the lockdown, prison officials found 16 cell phones, chargers and SIM cards on death row — among 143 smuggled phones found altogether in Texas prisons. Authorities are investigating how so many phones got into Texas prisons, especially onto death row. On June 16, 2010, Nelson was remanded to the trial court due to mitigating factors during the sentencing phase consistent with Penry. In August 1988, a jury found applicant guilty of the offense of capital murder. The jury answered the statutory punishment questions in such a way that the trial court set applicant's punishment at death. This Court affirmed applicant's conviction and sentence on direct appeal. Nelson v. State, 848 S.W.2d 126 (Tex.Crim.App. 1992). On June 16, 2010, this Court remanded applicant's case to the trial court. It has been more than two years since the application was remanded. Accordingly, we order the trial court to resolve any remaining issues within 90 days from the date of this order. The clerk shall then transmit the complete writ record to this Court within 120 days from the date of this order. Any extensions of time shall be obtained from this Court. Nelson's sentence has been overturned by the Texas Court of Criminal Appeals.